In 2012 Congregation Rodeph Sholom in Manhattan received UJA-Federation’s Synagogue Inclusion Award. The awards, given annually, recognize synagogues that create inclusive programming for people with disabilities. Through the award, UJA-Federation highlights the need for our community to open doors and embrace people with autism or other disabilities. 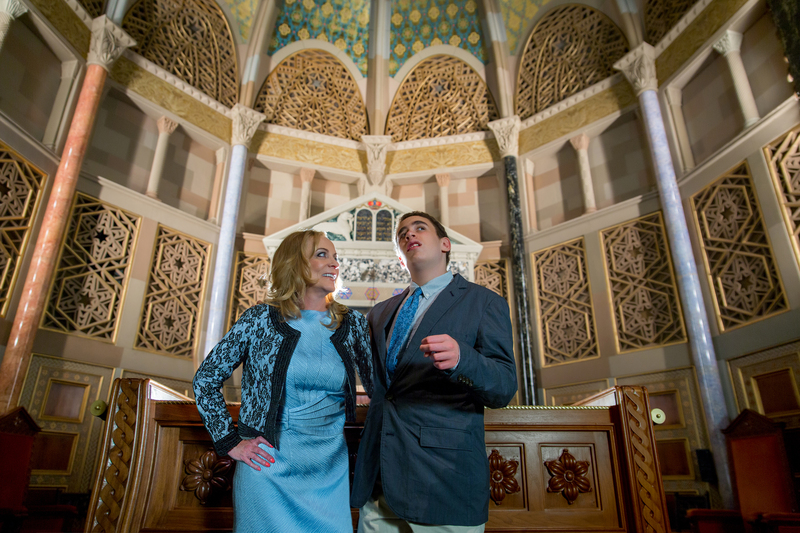 Joey Lowenstein and his mother were honored to recently have the UJA feature Joey’s story. Roberta Lowenstein and her son Joey, 16, who was diagnosed with autism at age two-and-a-half, are members of Rodeph Sholom and often attend inclusion services on Shabbat and holidays, led by Rabbi Ben Spratt. Here Roberta and Joey share what these services have meant to them. Joey shared his responses by spelling out his words on a letter board, a technique he learned at age 14 through the Rapid Prompting Method (RPM). Why did you go to Congregation Rodeph Sholom? Roberta: About two years ago Joey started asking questions about his dad, who passed away almost 10 years ago. I asked one of Joey’s doctors, “What do I do?” He said, “You need a spiritual person.” And I had read in the paper that Rodeph Sholom was having special needs services. It rang a bell, too, because that was the temple I had gone to as a child. My parents were married there in 1948. I reached out to the temple and they put me in touch with Rabbi Spratt. I went to see him and Rabbi Spratt was very welcoming and had Joey come in. We started going to the special needs services, which were very welcoming, warm.
. . . read more at the original article on the UJA America website (click).